강릉시 사천면 사기막리에 위치한 용연계곡은 운계봉(530m)과 황병산자락 천마봉(1,015m) 사이의 사천천을 따라 형성된 계곡으로 전체길이는 약 6㎞에 달한다. 용연계곡은 하천의 침식․운반․퇴적작용과 풍화로 형성된 화강암 지형이 잘 발달된 곳으로 소규모 폭포(瀑布), 폭호(瀑湖), 담(潭), 소(沼) 등의 하천지형․암석하상․자갈하상이 연이어 펼쳐져 주변의 울창한 수목과 어우러져 매우 수려한 자연경관을 보여주는 지질․지형적 가치가 우수한 곳이다. 용연계곡은 하류에서 상류부까지 약 6㎞정도이며, 계곡 최상류에는 높이 약 20m의 2단으로 형성된 수려한 ‘양지폭포’가 있어 계곡의 절정미를 이루고 있다. 그리고 계곡 하류를 향하여 계속되는 수많은 소와 폭포는 계곡의 아름다운 자연경관을 보여주며, 가을에는 계곡 암반사이로 쉼없이 흐르는 초록빛 맑은 물과 계곡 주변의 짙게 물든 단풍과 어우러져 매우 아름다운 모습을 보여준다. 용연계곡 일원은 신라시대 자장율사가 창건한 것으로 알려지고 있는 용연사가 있으며, 용연사의 불교문화와 용연계곡의 용소에서 거행하는 마을 전통제례문화행사, 사기막리 일원의 요업문화 등 역사문화적 요소도 가치가 큰 곳이다. 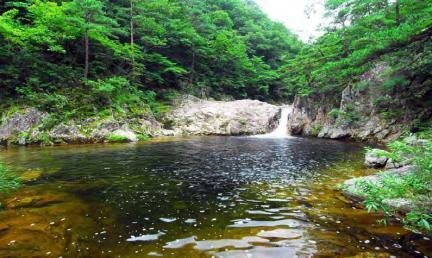 Yongyeongyegok Valley is located in Sagimak-ri, Sacheon-myeon of Gangneung, along with Sacheoncheon Stream, which flows between Ungyebong Peak (530m) and Cheonmabong Peak (1,015m). 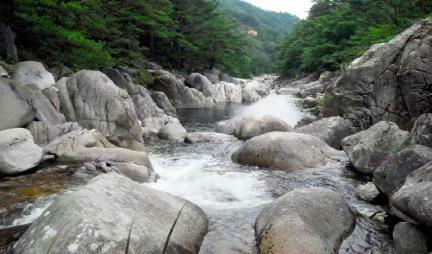 The total length of the valley is about 6km. This valley displays a variety of geographical features, such as waterfalls, plunge pools, basins, and river beds with boulders and pebbles, as well as granite landforms. These features, which have been formed by erosion, transportation, and sedimentation of a stream, are now in perfect harmony with densely wooded forests and present a splendid landscape. 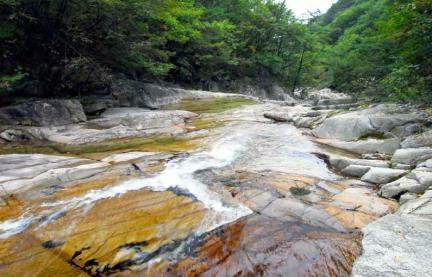 In particular, the valley includes numerous basins and waterfalls that create a beautiful landscape. 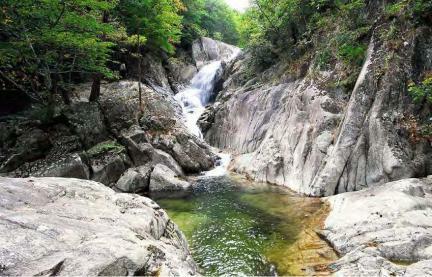 Among them, Yangjipokpo Falls, a two-tier 20m-high waterfall situated in the uppermost part of the valley is the highlight of this scenic site. In fall, the clear water flowing through the valley looks all the more wonderful amid the autumnal splendor of myriad red and yellow leaves. This area also contains diverse cultural heritages. Yongyeonsa, a Buddhist temple located nearby, is known to have been built by the monk Jajang during the Silla Dynasty, while a neighboring village called Sagimak-ri was famous for its ceramic culture. A traditional ritual of the village has been held in this valley as well.